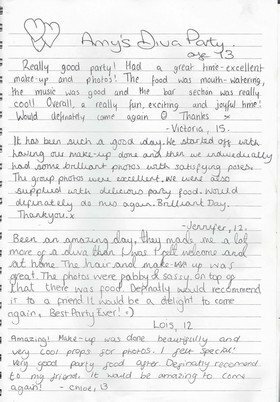 “My daughter Lily had a Diva Birthday party with Sharon which was a fantastic experience for her and her friends. We decided to use Sharon again for a portrait sitting which once again was amazing, she made the whole experience for my daughter very relaxing and enjoyable. Most importantly Sharon asked us what kind of photos we expected at the end of the shoot and what we were aiming to achieve and 100% gave us the result we wanted. I have just viewed my photos online and WOW WOW WOW is all I can say. “Thank you for a lovely evening, the girls had a fab time, the photo has been taken all around Sleaford this morning and shown to all the staff at the shop (Blanchards Coffee Shop), Ellie loves it. Thank you” Emma Massey – mum. “Phoebe had an great time she came home telling me how much fun it was ….